Once known as the “old man’s club” but over the years that has changed dramatically! We all follow Rotary International’s mission of Service Above Self and follow the 4 way test! Every year we give away scholarships to deserving students and help on service projects in Yuma and in other international areas. Recently we fixed up a school in Mexico and added on to a park for wheelchair accessibility. You can find Yuma Rotarians at The St. Patty’s Day Auction, Sausage Fry, Sports Banquets and Yuma County Fair. Everyone one of us work together for 1 common goal! 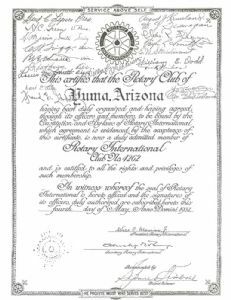 The Rotary Club of Yuma was chartered on May 4, 1937 with 19 members. Then District Governor Spencer Kimball of Safford promoted the formation of the new club, and under the sponsorship of Phoenix Rotary Club No. 100, the charter was presented at the Knights of Columbus Hall in the Immaculate Conception School on Fourth Avenue. Fred Lynes was the first President, H.C. "Skin" Green was Vice President, H. Marvin Smith was Secretary. 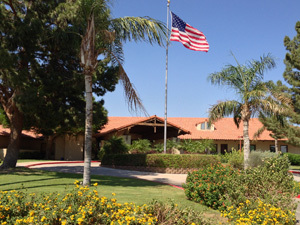 Yuma Rotary meets every Tuesday at 12:00 noon at the Yuma Golf and Country Club with the exception of holidays. 1st .. Is it the TRUTH? 2nd ... Is it FAIR to all concerned? 3rd ... Will it build GOODWILL & BETTER FRIENDSHIPS? 4th ... Will it be BENEFICIAL to all concerned? The world's first service club was the Rotary Club of Chicago, founded in February 23, 1905 by Paul P. Harris and three of his friends. The name "Rotary" was derived from the early practice of rotating meetings amount members' offices. Rotary International expanded and has grown to an association of over 33,000 Clubs located in more than 200 countries. Each club meets weekly to determine its own service activities and began by focusing on communities in need and helping the young and elderly. More recently, clubs worldwide have concentrated their efforts on the eradication of Polio, clean water, literacy, and drug abuse prevention programs as well as many other international and local projects. 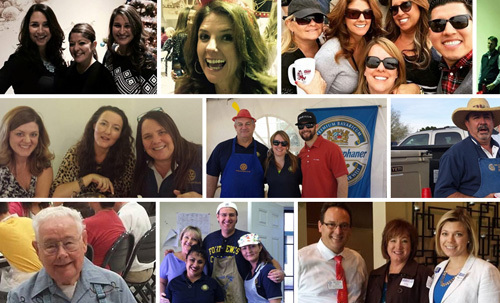 Today Rotary is a growing organization of well over one million volunteer business and professional men and women united worldwide. Best described by the motto "Service Above Self", Rotarians provide humanitarian service, encourage high ethical standards in all vocations, and build universal peace and goodwill.